Question: What did Jesus say concerning the study of the scriptures? Question: In searching the scriptures, what is it able to do to the believer? Question: What does Jesus say to those who acquaint themselves with the letter of the Scriptures yet fail to understand them? Answer: “Jesus answered and said unto them, ye do err, not knowing the scriptures, nor the power of God.” Matthew 22:29. Question: How credible are the Holy Scriptures? Answer: “All scriptures is given by inspiration of God, and is profitable for doctrine, for reproof, for correction, for instruction in righteousness: That the man of God may be perfect, throughly furnished unto all good works.” 2 Timothy 3: 16, 17. Question: How are we to truly ascertain the credibility of the Holy Scriptures? Answer: “ For the prophecy came not in old time by the will of man: but holy men of God spake as they were moved by the Holy Ghost.” 2 Peter 1:21. Question: Did God ever promise or suggest that changes should be made to His Holy scriptures? Answer: NO.. ..NEVER. Not one instance in the Bible is recorded that God changed His Holy Word. Instead He said. “Heaven and earth shall pass away; but my words shall not pass away.” Matthew 24: 35. Question: What description is given of the Scriptures? Answer: “We have also a more sure word of prophecy; whereunto ye do well that ye take heed, as unto a light that shineth in a dark place, until the day dawn, and the day star arise in your hearts: Knowing this first, that no prophecy of the scripture is of any private interpretation.” 2 Peter 1:19 20. Question: What did Jesus Christ mention about the book of Daniel? Answer: “When ye therefore shall see the abomination of desolation, spoken of by Daniel the prophet, stand in the holy place, (whoso readeth, let him understand) Matthew 24:15. See Ezekiel 8, 2 Chronicles 36, Jeremiah 17. Question: In relating to our time what other book of the Bible should heighten our focus? Answer: “ Blessed is he that readeth, and they that hear the words of this prophecy (Revelation), and keep those thing which are written therein: for the time is at hand.” Revelation 1:3. Question: Is there any assurance that we can accept the written word.? Answer: Christ said, “Sanctify them through thy truth; thy word is truth.” John 17:17. Question: What event has to occur before the end of the world comes? 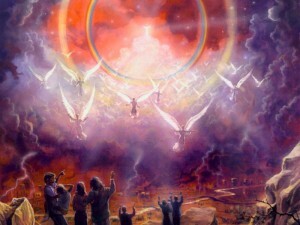 Question: What conditions would exist in the world prior to Christ’s coming in the skies? Question: Are we really living in the last days of earth’s history,? How do we know? Answer: “This know also, that in the last days perilous times shall come. For men shall be lovers of their own selves, covetous, boasters, proud, blasphemers, disobedient to parents, unthankful unholy. Without natural affection, trucebreakers, false accusers, incontinent, fierce, despisers of those that are good, traitors, heady, highminded, lovers of pleasures more than lovers of God; Having a form of godliness, but denying the power thereof: from such turn away.” 2 Timothy 3:1-5. Is this not the condition of our world today? Question: When these things begin to happen, what should we do?. Answer: “ And when these things begin to come to pass, then look up, and lift up your heads; for your redemption draweth nigh.” Luke 21:28. Question: What urgent warning did Jesus Christ gave us concerning the time of the end? Question: The scriptures mentioned of signs and wonders of the end of time. It states of a decline in morality. We see today the signs that were prophesied of His coming.. What did Jesus say of the surety of these prophecies? Answer: “Verily I say unto you, This generation shall not pass, till all these things be fulfilled. Heaven and earth shall pass away, but my words shall not pass away.” Matthew 24:34 35. Question: What Christian grace are we exhorted to exercise in our expectant longing for this event? Question: Who alone knows the exact day and hour of Christ’s coming? If Jesus Christ said it, then I believe it, and therefore that settles it. What about you, do you believe and accept the scriptures? Are you ready to willingly and earnestly study His word? Our sincere hope is that as you study these blessed truths you may get to know Him and have an even closer walk with Him. May God continue to bless you as you follow His precepts.